Considering my wife’s active pursuit of a calorifically balanced and inherently healthy diet (does not compute), this was like handing the keys to the candy shop to a 10yo child! So many options, but in the end it came down to cuisine; French to be precise. Whether it’s the microcosm of Hobart, or the melting pot of Australia’s larger capital cities, French cuisine is not prolific. 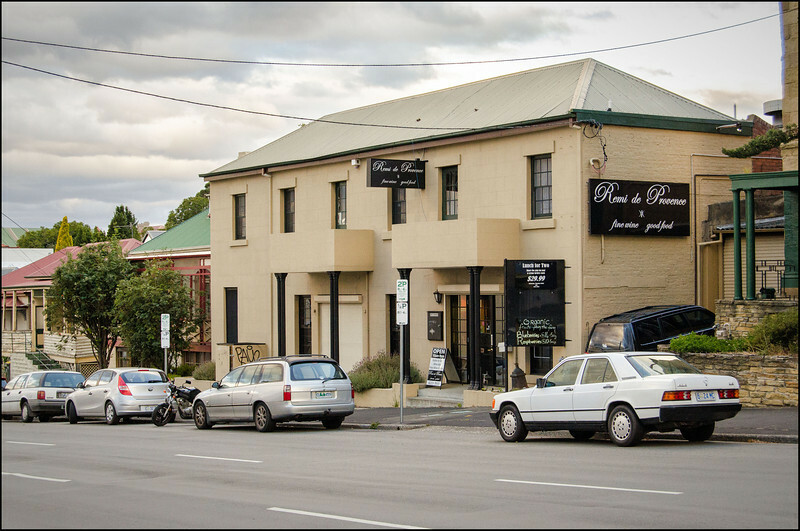 In fact, I recently undertook a quasi-scientific breakdown of Hobart’s restaurant scene and found that of more than 250 cafes and restaurants, only 3 could be considered as specialising in French cuisine; Le Provencal, Point Revolving Restaurant and Remi de Provence. It may sound a little simplistic, and in hindsight it was probably a little unwise, but it came down to bread and wine. 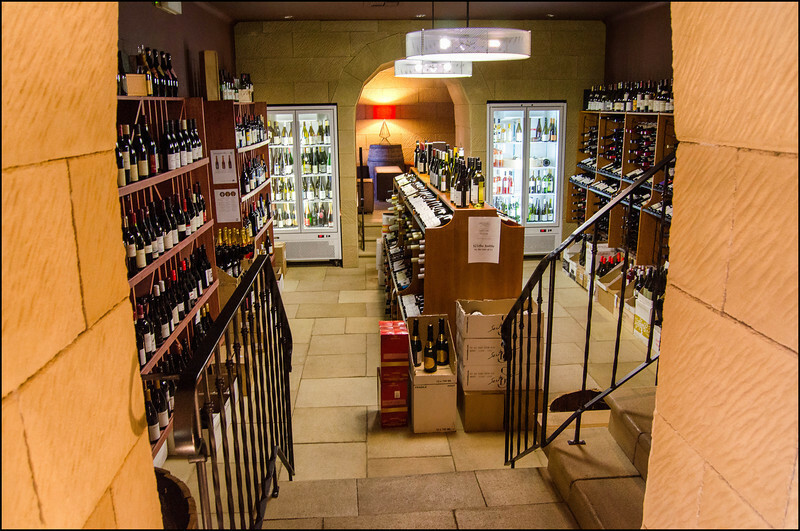 It had been four years since we last ate at Remi’s, yet the enduring memory from that meal was the sensational quality of the bread rolls that accompanied our meals, and to a lesser extent, the fantastic array of wines on offer in their wine bar. Remi’s is an interesting restaurant, if I can call it that. The question arises as it’s difficult to pigeonhole Remi’s into any one particular style. In the mother tongue it’s known as a “cave à manger”, or eat-in wine bar, with the focus being on the wines more so than the food. In Aussie-speak you could say it straddles the boundaries of bistro and fine dining, offering elements of each yet also providing customers with the unique option of simply enjoying wines by the glass in their extensive wine bar, or purveying their selection of cheeses and terrines in the foyer. A great combination, but after 10-15 minutes waiting in the foyer for someone to deign to descend from on high to greet and seat us, the delicacies on offer had lost their gloss. Was the front door sensor busted? Were they simply run off their feet? Perhaps that’s just their style? Some may see this as a little unfair but whatever it was, it did a fantastic job of reinforcing the stereotypical perceptions of the French! After taking a seat in the dining area, buzzing with conversation and surrounded by fantastic murals, we were presented with a couple of very enticing food menus! Personally I would have a preferred a drinks menu though, and after waiting 5 minutes or so I took matters into my own hands and flagged down one of the waitresses standing idle near the bar. What a wine list it was!! 26 pages full of Australian and international wines, ciders, spirits and liquors, ranging from $30 up to a wallet shattering $3700 for a French pinot. This was one of, if not THE most comprehensive wine list we’ve come across in Hobart. Yet when you consider that in a previous incarnation the proprietor Remi Bancal was head sommelier at the illustrious Banc restaurant, it isn’t all that surprising at all. He clearly has a passion for fine wine! After placing our food orders we were surprised by the presentation of a couple of complimentary amuse-bouches. Looking back, these just about took the award for dish of the evening! 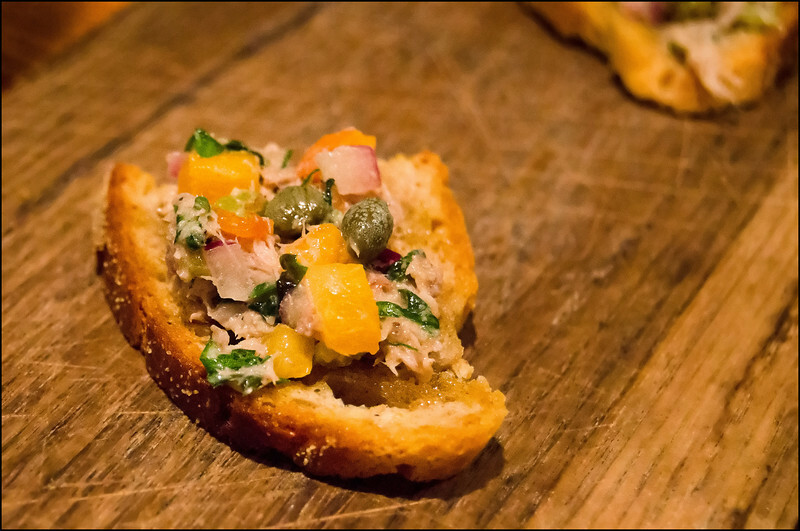 Unfortunately I can’t recall all the ingredients, but the saltiness of the caper berries, together with the citrus and seafood was incredibly refreshing, acting as the perfect palate cleanser. This was followed by salmon rillettes with toasted bread and apple salad for Karen, and a steak tartare for myself. 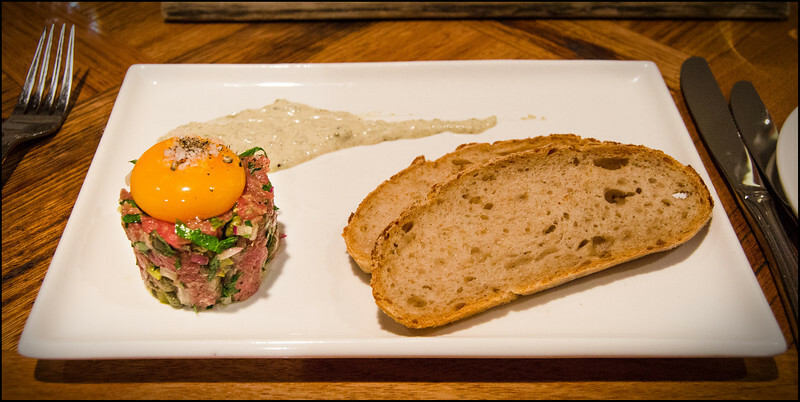 While the salmon rillettes were tasty, they were nothing compared to steak tartare ($16.50)! The balance of herbs and seasoning with the steak was precise and could not be faulted. The beef was so flavoursome and tender that it would be enough to convert any ‘ewww, it’s raw’ sceptics to fully fledged tartare devotees in an instant! 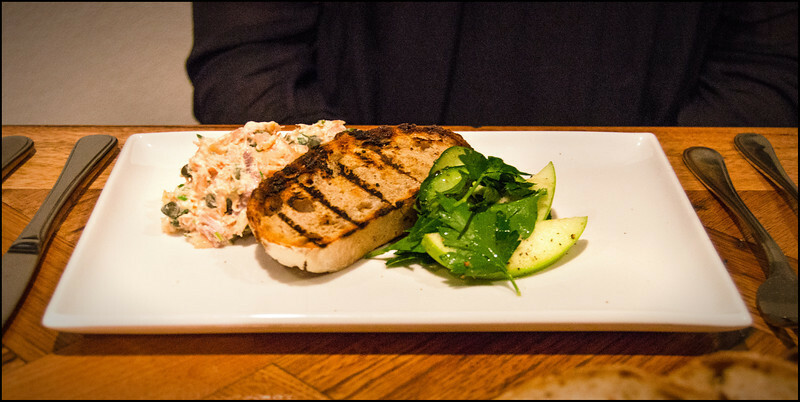 Add to this the tangy caper mayonnaise, creamy egg yolk and the crunchy toast and you’ve got one sensational entrée! 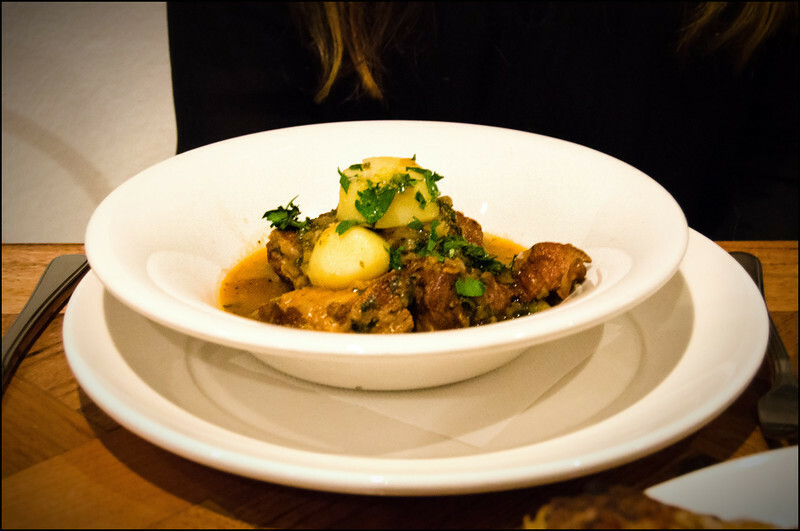 Main course for Karen was the Plat du jour, or Plate of the day, which on a Saturday is a slow braised lamb forequarter with potatoes ($28.50). With a surprisingly light consistency, the herb and tomato broth was the highlight, balancing against the lamb very well. 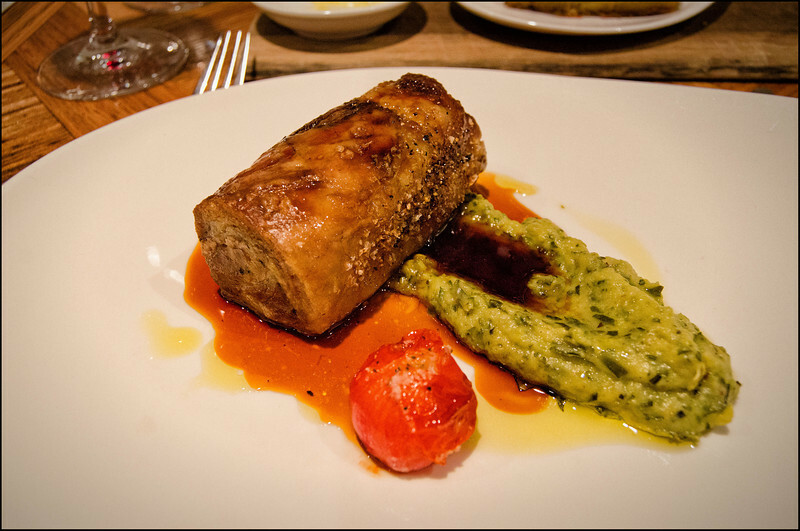 I ordered the twice cooked lamb with zucchini puree, mint oil and herb infused lamb jus ($28.50). This was one of the richest dishes I’ve had in some time!! I hadn’t eaten much all day, yet this smallish meal only took a matter of minutes to put me at my limit. Fantastic depth of flavour, yet a little bit too much for me. Perhaps a smaller portion size may have resulted in a different outcome? Still, we did choose French cuisine and this was Provencal on a plate! Desserts were a fantastic finish to the meal, with Karen choosing the selection of three fruit sorbets ($12.50), while I tried, for the first time in my life, a crème brûlée ($12.50). Yes, that’s right, you read that correctly. In all my 37 years I had never had a crème brulee! Caramel just doesn’t do it for me, and eggy/custardy/milky desserts aren’t at the top of my list either normally. 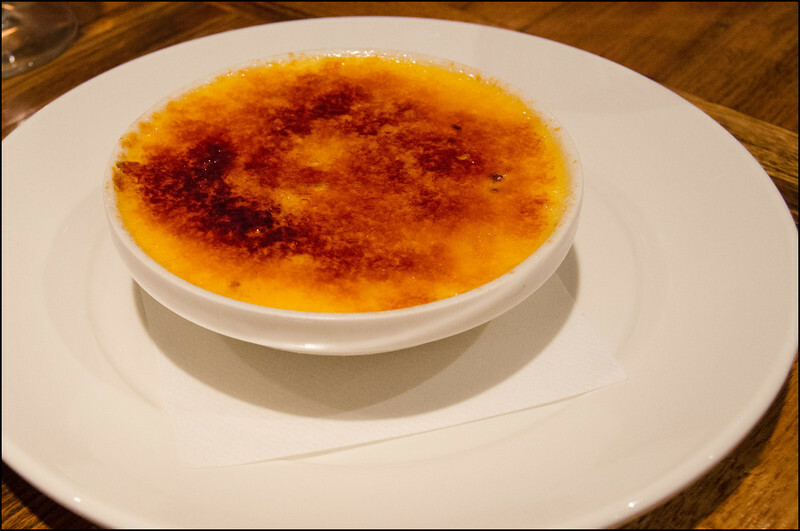 But, if I was ever going to get a great crème brûlée, it was going to be at a French restaurant right? Fantastic choice in the end and it may even entice me into ordering one again. Awesome crunchy caramel shell, with a delightful hint of toasted toffee. Smooth and decadent custard base, yet not overly heavy. I can now see why this dessert is held in such high regard! 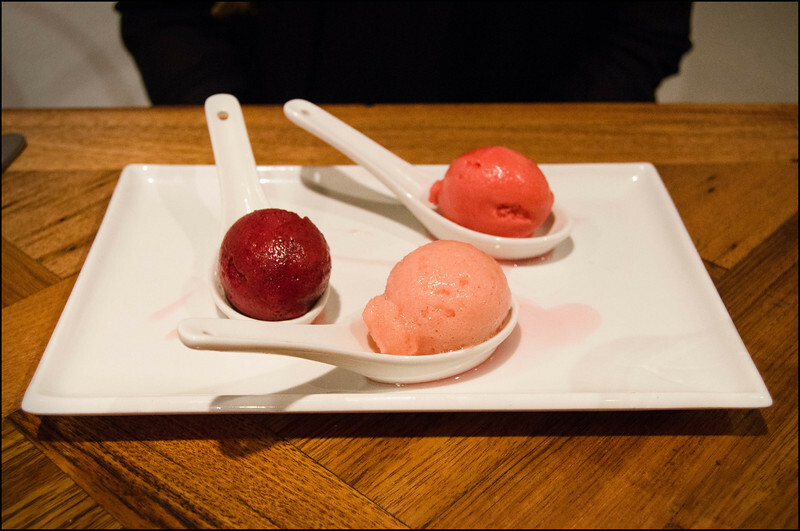 The sorbets were also very good, yet in a different way. A satisfyingly refreshing end to what had been a very rich meal up until that point in time. In hindsight, as so often occurs, the memory can be so much more than the reality. While our meal at Remi’s was good, it didn’t live up to the expectations that I had, perhaps unrealistically, established in my mind. My fault, or Remi’s? A little of both I suspect. The service on the evening started horrendously and marginally improved as the evening progressed. However, by the time the food was presented the damage had been done and we left with a slightly sour taste in both our mouths. Sometimes good food just isn’t enough.